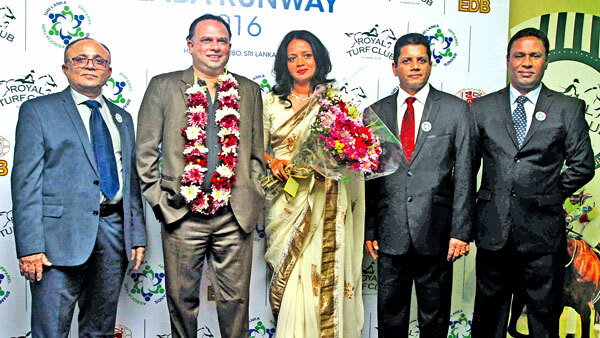 The Sri Lanka Apparel Brands Association (SLABA) together with The Royal Turf Club and the Export Development Board, staged the Royal Turf Club SLABA Runway 2016, on September 21 that featured the cream of Sri Lanka’s apparel brands who showcased their products at what was the first of an Annual Ramp Extravaganza. Over 180 outfits, showcasing 20 brands, shown to advantage by 24 of Sri Lanka’s leading models, choreographed by Brian Kerkoven, made the inaugural Royal Turf Club SLABA Runway 2016 an unforgettable event, flying high the Sri Lankan flag of fashion . The SLABA membership which has over 60 members including Reborn, EKKO, Emerald, Signature, Manzari,Trendy, Rough, Arista , LiCC Jeans, Rainco, JEZZA, Avirate, GFlock, Dmaxx, Aurora, Anationz, Perri Allen ,Vantage, Uptown Kandy, Andre, and many others, showcased their brands, with title sponsor, the Royal Turf Club partnering with them in what was acknowleged as ‘a perfect fit’, seeing that horse racing and fashion are synonymous world wide, while the EDB perceived to the engine of growth , have done more than their fair share to promote Sri Lanka’s apparel brands . The apparel industry, JAAF, government and private sector heads, as well as Sri Lanka’s leading fashion and beauty icons, were present to witness our very own home grown brands take to the ramp and wow the audience. SLABA represents Sri Lankan apparel brands that contribute to the country and economy. Today the retail clothing industry in Sri Lanka is estimated at US$2 Billion and above, with 50% of the market share being contributed by apparels made in Sri Lanka. It is SLABA’s aim to establish an annual event where both industry and non industry high net worth individuals could interact, exchange ideas and forge links for the overall betterment of not just the apparel industry but the economy of the country. President SLABA, Indradatta Dharmawardene said “Today's show is the first of an annual ramp extravaganza and we are thankful for the Royal Turf Club for joining us as the title sponsor. We are also grateful to the EDB our strategic partner and the JAAF for backing us up on this journey. As a world class apparel manufacturing hub, the growth of the local apparel export industry has reaped dividends for the Sri Lankan economy. "Some of our members have made strides in international markets bringing in valuable foreign exchange and recognition for local apparel brands, setting standards and establishing manufacturing skills that have undoubtedly benefitted the economy”. Dharmawardene also thanked Ramani Fernando Salons and the Hilton Colombo for coming on board with SLABA as their Hair and Make Up partner and Partner Hotel.